Here at Andy Mohr Toyota, we’re all about providing our customers in Indianapolis, Avon, and Plainfield, Indiana with a wide selection of great trucks. 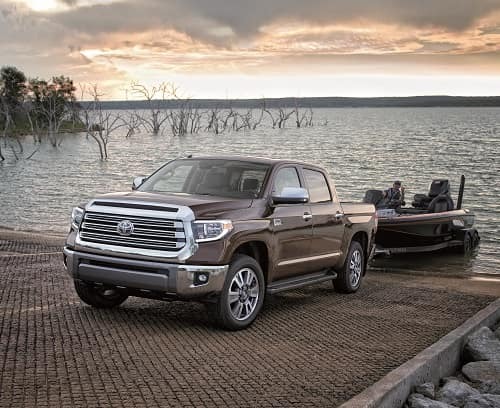 Luckily, the 2019 Toyota Tundra has multiple trim levels to make it easy! Regardless of whether you go with the SR, the SR5, the Limited, the Platinum, or the 1794 Edition, you can expect a powerful pickup truck that’s outfitted to work hard. Keep reading to discover each model. The Tundra SR is where it all starts – and we’re off to a great start! This is a 2019 pickup that’s designed to get the job done, regardless of what the job is. That’s why it offers an available fully Integrated Trailer Brake Controller with its 5.7L V8 engine. This way, your truck and trailer brakes are 100% synchronized. Combine that with the awareness and visibility you’ll gain from a set of Daytime Running Lights (DRL) and an Integrated Backup Camera, and you’ve got one heck of a work truck. What will you do with it? This thing is just as good-looking as it is hard-working and long-working, and that can’t hurt. The 2019 Tundra Limited, along with a few of the other configurations, comes with Toyota Safety Sense™ P.
Pre-Collision System: Engineered with the intention of preventing an accident before it’s way too late. Lane Departure Alert: Unintentionally drifting out of your lane is bad news – especially with a trailer. Dynamic Radar Cruise Control: This is cruise control for the 21st century. Not only will it work to keep you at a constant speed, but to keep a consistent following distance between you and the car ahead. Then you’ve got the Toyota Tundra Platinum, which builds upon that suite of high-tech safety features with a Blind Spot Monitor (BSM) and a Rear Cross-Traffic Alert (RCTA). Its technology isn’t confined to just safety. It also comes with an Entune™ Premium JBL® Audio setup with Integrated Navigation. Last but certainly not least, the Tundra 1794 Edition sports all those little details that make it just as luxurious as it is rugged. From Western-themed interior/perforated Brown premium leather-trimmed seating to optional 20-inch chrome-clad alloy wheels and beyond, this thing is designed to turn heads. When you get down to brass tacks, the Tundra’s capable of towing over 10,000 pounds. 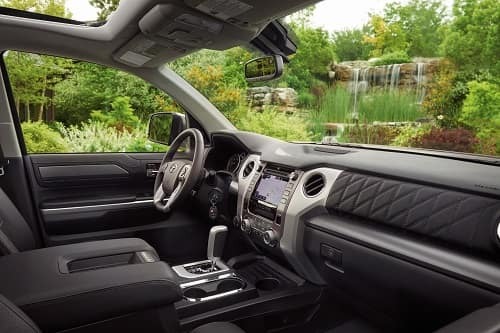 Contact us right now to test drive the 2019 Toyota Tundra trim levels! So, which 2019 Tundra would you like to test drive? The best news is that we have a bunch of them in our Andy Mohr Toyota showroom. Just call us, chat with us on our website, or stop by our dealership today. Don’t forget, we’re only a few minutes down the road from Indianapolis, Avon, and Plainfield, IN.